Knowing your business's break even point is very important. Find out why the break even point matters, and how you can calculate it. The break even point is the point at which a business is neither profitable nor in debt. In other words, all expenses have been paid, and enough money has been earned to settle all outstanding accounts. Any sales that are made after the break even point represent a profit. 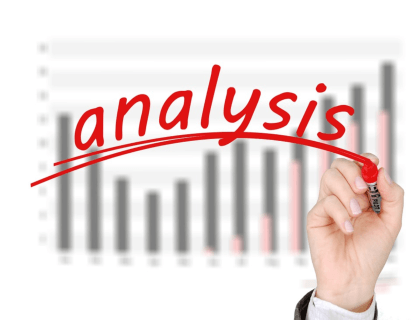 Entrepreneurs typically conduct a break even analysis when they are starting a business to find out how long it will take them to go from carrying a loss to being profitable. With this free Microsoft Excel template, you can input all of your sales and financial data into a spreadsheet to find your break even point. *When opening the download, click "Ignore" to keep the existing format and edit the spreadsheet. Fixed costs: These are necessary expenses that must be paid before your business starts operating. Fixed costs include things like office space, insurance, and equipment. Unit selling price: The price that you choose to sell each unit for. Variable costs: Recurring costs that are incurred with every unit produced. Variable costs may include raw materials and labor. Fixed costs stay the same regardless of production volume, while variable costs increase or decrease in direct proportion to the number of units that are produced. If you've done the math and determined that you have fixed costs of $10,000.00, variable costs of $1.00 per unit and a unit selling price of $5.00, you can plug these numbers into the formula. You can see that by entering the information into the formula, we've determined that you need to sell 2,500 units to break even in this particular scenario. A break even chart visualizes the break even point on an X and Y axis. This can be helpful if you are trying to gauge your progress and see exactly how close your business is to breaking even. As you can see, total dollars (revenue + cost) are recorded on the Y-axis, and the number of units sold is recorded on the X-axis. A break even chart is a great way to summarize your break even analysis and give a visual depiction of your break even point. Where can I find a break even point calculator? You can use the break even formula to calculate your break even point. How long will it take my business to break even? 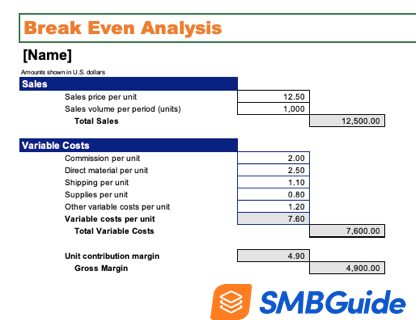 The break even analysis shows you how many sales you will need to make before your business breaks even, but it does not tell you how long it will take to get there. This depends on the rate at which you sell your goods or services. The contribution margin is the difference between the unit's selling price and the total cost (fixed and variable) of producing the unit. Once the break even point is reached, the contribution margin represents revenue. The concept of "breaking even" is fundamental to business. As an entrepreneur or small business owner, knowing your break even point and understanding how to get there will help you to plan ahead and set realistic sales goals. If you are looking for more information about starting your own business, check out our How to Start a Business guide.